No other two-coat transparent wood finish system lasts as long as Lifeline Ultra-2 with a clear topcoat of Lifeline Advance. It is so durable that it is covered by a 5-year limited warranty. This advanced waterborne formula enriches the look of natural wood grain and protects against damaging UV from the sun. Homeowners and contractors appreciate just how easy it is to apply with an airless sprayer or brush. Remember – not all waterborne stains are created equal. Order your free sample of Lifeline Ultra-2 and see for yourself. Use Lifeline Advance Clear Top Coat to qualify for a 5-Year Warranty on Lifeline Ultra-2. Easy to apply with sprayer and back brushing, even for inexperienced first-time log home owners like us. Easy to clean up with water. Pigment in stain hides some of the imperfections/staining in logs. Excellent customer support. We have only used Perma-Chink products. We know people who have used other stain and found out the quality wasn't there. We stepped in and told them that Perma-Chink products were the better product. We just restained our home and with the top coat on it our home looks like a brand new log home. This product is hands down the best we have ever used or will ever use. Customer service is great to work with as well. Thank you! We LOVE the entire line of Permachink products! This product applies easily, doesn't have an offensive odor and leaves a beautiful color! We are 4 years out from initial application (followed by Advance!) and the house still looks beautiful! We had our cedar log house cob blasted to remove Sikkens that was peeling and had mold under it. We research a number of products since we are located on a ridge that gets extremely harsh weather conditions.We decided on Perma-Chink, using two coats Lifeline Ultra-2 in Dark Natural and two coats of Lifeline Advance. Its been three years and it looks the same as when it was first applied. All we do is wash it down twice a year. Thank you Perma-Chink for creating great products! This product is very easy to apply and the color was absolutely beautiful. We ordered quite a few samples to pick the one that was just right and this made our home look amazing! We have recommend Perma-Chink to anyone we’ve talked to about the products because we like it that much. Thanks so much! I have completed refinishing or touching up my log home...it had been 7 years so very happy with durability of the lifeline ultra 2 / advance. I just want to say thanks Perma-Chink! I used that Ultra 2 Sequoia on our house and wow! We can't believe it! Beautiful! I have used several Perma-Chink products with great results and this stain did not let me down. It comes in a lot of colors that we liked, but we finally decided on Hazelnut. We sort of wished that you could apply just 1 coat (like Ultra-7 indicates), but Ultra-2 was really easy for non-professionals like us to stain with. We applied the 2 coats as recommended and it looks wonderful! I had some serious doubts after we had completed the first coat of Ultra 2, but after the second coat was applied, all was well; the cabin was beautiful!! We used the Advance Gloss over it to protect it and will wash it every year as recommended to keep it looking that way. Lifeline Ultra-2 is by far the best wood finish for Exteriors on the market today, period! And I have tried several other brands with disappointing results that cost me time and money. Thank you Perma-Chink products. We have finished three exterior sides of our log house with Lifeline Ultra-2 and hope to finish the project this summer. We are very pleased with how easy it is to apply with an airless sprayer and how great it looks. You cannot go wrong with Perma-Chink Products and services, I have purchased products from this company for 15 years and I have not been disappointed yet! 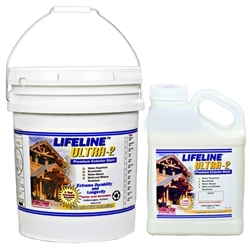 Lifeline Ultra 2 is the best stain on the market period! We applied two coats of the Ultra-2 Bronze and the topcoat about two years ago and it still looks really good. We were looking for a stain sealer product that was easy to use and lasted a long time and a friend recommended this product to us. No complaints so far. Good choice for anyone that has a log cabin.